Most people give more thought to choosing frames for their eyewear, but how much thought goes into picking out the type of lenses to wear. Let’s break down some types of lenses. Aspheric: Conventional lenses have a front surface that is spherical, meaning it has the same curve across its entire surface. 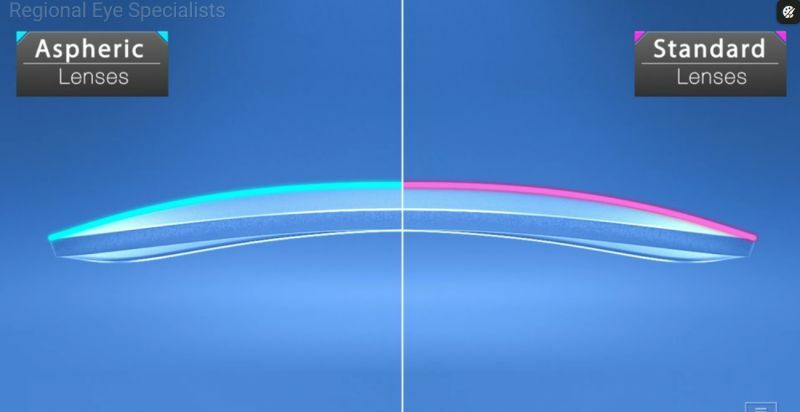 Aspheric lenses have a more complex front surface that gradually changes curvature from the center out to the edges. They are typically thinner and lighter than other lenses. Trifocal: Lenses that have three regions which correct for distance, intermediate and near vision. Progressive lenses: Are no-line multi-focal lenses that look exactly the same as single vision lenses. A progressive lens give you a single stylish solution so you can see clearly at multiple ranges with one pair of glasses. Hi Index: A high index lens is a lens that has a higher “index” of refraction. This means it has a greater ability to bend light rays to provide clear vision for people with stronger prescription glasses. Photochromic: Photochromic lenses automatically darken when exposed to sunlight, eliminating the need for separate sunglasses in many cases. Available in all lens designs and materials, including bifocals and high-index lenses, photochromic lenses are a popular choice for all ages. Polarized: During the manufacturing process, a special chemical is applied to an eyeglass lens to polarize it. The chemical is laminated in a vertical pattern, which reorganizes light. This pattern blocks the light that is horizontal to eliminate glare, which is similar to how a window blind works. Glare typically happens when waves of light bounce off reflective surfaces, such as a lake, snowy hillside, or shiny car bumper. Because the surface is horizontal, the light is reflected horizontally. When you are wearing polarized sunglasses, the surface blocks the glare by filtering out the horizontal light waves that don’t fit through the chemical laminate pattern. There will be a quiz on this!! !